Answer: B, C, D. DHCP works dynamically to provide IP address, DNS, and default gateway information. Answer A is incorrect because the Network Time Protocol (NTP) provides clock information. Answer: A, B. POP3 receives email on an Internet server and SMTP sends email across a network. Answer C is incorrect because SNMP is a network management protocol and answer D is incorrect because DHCP is the dynamic host configuration protocol. A. Every device stops transmitting for a short time. B. A jam signal is sent to notify devices of a collision. C. A collision signal is sent to notify devices of a collision. D. A random back-off algorithm starts. Answer: A, B, D. When a collision occurs on an ethernet network a jam signal is sent to notify devices of a collision and a random back-off algorithm starts while every device stops transmitting for a short time. Answer C is incorrect because a jam signal is sent rather than a collision signal. Q4. What is the OUI of the MAC address 01:AB:4D:F2:89:10? Answer: D. The OUI of a MAC address is the organizationally unique identifier that is assigned by the manufacturer of the network interface card (NIC). The OUI consists of the first 6 hexadecimal digits. Answer A is incorrect because it only consists of 2 hexadecimal digits. Answer B is incorrect because it is not the first 6 hexadecimal digits of the MAC address 01:AB:4D:F2:89:10. Answer C is incorrect because it only consists of 4 hexadecimal digits. Answer: A, C. The MAC address is a unique hardware address in the broadcast domain and the manufacturer of the NIC provides MAC addresses. Answer B is incorrect because IP addresses are logical addresses used by the Network layer. Answer D is incorrect because a MAC address is not configured manually by a network administrator. Q6. At what layer of the OSI model do you find MAC addresses? Answer: C. MAC addresses are found at the Data Link layer of the OSI model. Answers A, B, and D are incorrect because MAC addresses are not found at the Transport, Network, or Physical layer of the OSI model. Q7. At what layer of the OSI model do you find sequence numbers? Answer: D. The Transport layer uses sequence numbers. Data segments are sequenced into their original order when they arrive at the destination. Answers A, B, and C are incorrect because sequence numbers are not found at the Application, Presentation, or Session layer of the OSI model. Q8. At what layer of the OSI model do you find IP addresses? Answer: B. Answer B is correct because IP addresses are found at the Network layer of the OSI model. IP addresses are logical or virtual addresses that are assigned at Layer 3 to identify the destination of a packet or datagram. Answers A, C, and D are incorrect because IP addresses are not found at the Transport, Data Link, or Physical layer of the OSI model. Q9. What kind of PDU is used at the Data Link layer of the OSI model? Answer: D. The Data Link layer uses frame PDUs to encapsulate data. Answers A, B, and C are incorrect because segments are used at the Transport layer, whereas packet/datagrams are used at the Network layer and bits are used by the Physical layer of the OSI model. Q10. What kind of PDU is used at the Network layer of the OSI model? Answer: B. The Network layer of the OSI model uses packets/datagrams. Answers A, C, and D are incorrect because the Application, Presentation, and Session layers of the OSI model transmit data. Q11. What kind of PDU is used at the Transport layer of the OSI model? Answer: A. Segments are used at the Transport layer of the OSI model. Answer B is incorrect because the three upper layers of the OSI model transmit data. Answer C is incorrect because the Data Link layer transmits frames, and answer D is incorrect because the Physical layer transmits bits. Q12. What is the correct order for data encapsulation? Answer: B. Encapsulation occurs from the Application layer and then is passed down through the lower layers of the OSI model. The PDUs are sent by the Application layer as data and then they are encapsulated with a segment at the Transport layer. At the Network layer the segment is encapsulated into a packet/datagram that is passed down to the Data Link layer, which encapsulates a frame and hands it off to the Physical layer, which uses bits. Q13. Routers look at the ________________ when making a routing decision. Answer: A. Routers look at the destination IP address to determine where to forward the packet. Answers B, C, and D are incorrect because a router does not examine the source IP address, destination MAC address, or source MAC address to make forwarding decisions. Q14. What protocol is assigned to port numbers 20 and 21? Answer: C. FTP is assigned to port numbers 20 and 21. Answers A, B, and D are incorrect because Telnet is assigned port number 23, DNS is assigned port number 53, and SMTP is assigned port number 25. Q15. What protocol is assigned to port number 80? Answer: B. HTTP is assigned port number 80. Answers A, C, and D are incorrect because SNMP is assigned port number 161, POP3 is port number 110, and DHCP is assigned ports 67 and 68. Answer: A, B. Telnet and HTTP are both protocols that use TCP. Answers C and D are incorrect because TFTP and NTP use UDP. Answer: A, C. DHCP and SNMP use UDP, whereas answers B and D are incorrect because SMTP and POP3 use TCP. Answer: B, D. Traceroute and ping are both commands that use ICMP. Traceroute traces the route or path taken from a client to a remote host. Ping enables you to validate that an IP address exists and can accept requests. Answers A and C are incorrect because neither show cdp neighbor nor Telnet use ICMP. Q19. What protocol maps a known MAC address to an IP address? Answer: A. RARP maps MAC addresses to an IP address, whereas answer B is incorrect because ARP maps an IP address to a MAC address. Answer C is incorrect because ICMP sends messages across the network via ping, and traceroute enables a router to respond to an ARP request that has been sent to a remote host. Answer D is also incorrect because some Unix machines (especially Solaris) rely on Proxy ARP rather than default gateways. Q20. What TCP/IP protocol provides terminal emulation to a remote host? Answer: C. Telnet provides for terminal emulation to a remote host. Answers A, B, and D are incorrect because HTTP is a web-browsing application, VPN is a private network that can access public networks remotely, and SNMP is a network management application. Q21. Briefly list the communication application protocols that are used at the Application layer of the OSI model and what service they provide. Answer: The following is a list of the protocols utilized at the Application layer of the OSI model and the functionality of each protocol. Q22. Describe how information is passed through the layers of the OSI model. Answer: The upper layers (Application, Presentation, and Session) pass data to the Transport layer. The Transport layer encapsulates the data into a segment that is handed down to the Network layer. The Network layer encapsulates the segment into a packet (or datagram) to be handed down to the Data Link layer. The Data Link layer encapsulates the packet (or datagram) into a frame and sends it to the Physical layer. The Physical layer then encapsulates the frame into a bit to be sent over the network. Q23. Define Positive Acknowledgments and Retransmission (PAR). Answer: Used by TCP, PAR is the process by which the source device begins a timer when a segment is sent and retransmits if the timer runs out before an acknowledgment is received. The source device keeps track of segments that are sent and requires an acknowledgment for each segment. The destination device acknowledges when a segment is received by sending a packet to the source that iterates the next sequence number for which it is looking from the source. Q24. Describe the steps involved in a three-way handshake. Answer: First, a connection agreement segment is sent to the recipient asking to synchronize systems. Second, a second and third segment acknowledge the request to connect and determine the rules of engagement. Sequencing synchronization is requested of the receiving device. A two-way connection is established. Third, a final segment is sent as an acknowledgment that the rules have been accepted and a connection has been formed. Q25. List the differences between TCP and UDP. Answer: The following table lists comparisons of the key characteristics of the TCP and UDP protocols. Q26. List the key functionalities of the Access layer of the Cisco hierarchical model. Q27. List the key functionalities of the Distribution layer of the Cisco hierarchical model. Q28. List the key functionalities of the Core layer of the Cisco hierarchical model. The Distribution layer manages access to the core. Answer: A. The device shown is a hub and hubs place all ports in the same broadcast domain and the same collision domain. Q30. With respect to the OSI model, which of the following are correct statements about PDUs? A. A segment contains IP addresses. B. A packet contains IP addresses. C. A segment contains MAC addresses. D. A packet contains MAC addresses. Answer: B. The contents of a protocol data unit (PDU) depend on the PDU as they are created in a specifi order and their contents are based on that order. A packet will contain IP addresses but not MAC addresses as MAC addresses are not present until the PDU becomes a frame. Q31. You are the Cisco administrator for your company. A new branch office is opening and you are selecting the necessary hardware to support the network. There will be two groups of computers, each organized by department. The Sales group computers will be assigned IP addresses ranging from 192.168.1.2 to 192.168.1.50. The Accounting group will be assigned IP addresses ranging from 10.0.0.2 to 10.0.0.50. What type of device should you select to connect the two groups of computers so that data communication can occur? 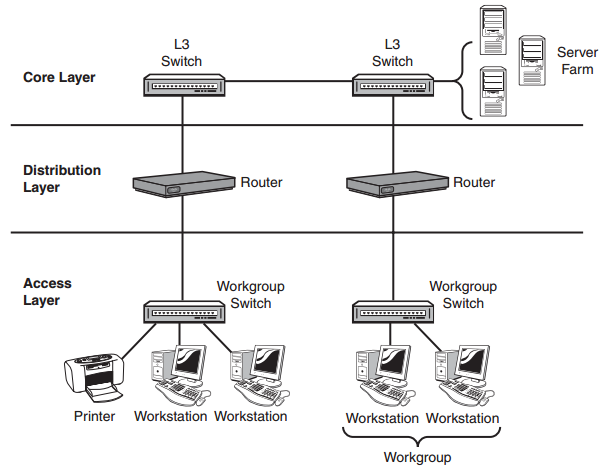 Answer: C. You should select a router to connect the two groups. When computers are in different subnets, as these two groups are, you will require a device that can make decisions based on IP addresses. Routers operate at layer 3 of the Open Systems Interconnect (OSI) model and make data-forwarding decisions based on layer 3 networking information, which are IP addresses. They create routing tables that guide them in forwarding traffi out of the proper interface to the proper subnet. Q32. The most effective way to mitigate congestion on a LAN would be to__________________? Answer: C. Replacing the hub with a switch would reduce collisions and retransmissions which would have the most impact on reducing congestion. Q33. In the work area below draw a line from the OSI model layer to its PDU. Answer: The given layers of the OSI model use the PDUs shown in the above diagram. Q34. In the diagram below what procedure is shown? Answer: C. The diagram depicts the three steps taken to create a TCP connection. Q36. You need to provide network connectivity to 150 client computers that will reside in the same sub network, and each client computer must be allocated dedicated bandwidth. Which device should you use to accomplish the task? Answer: B. You should use a switch to accomplish the task in this scenario. A switch is used to provide dedicated bandwidth to each node by eliminating the possibility of collisions on the switch port where the node resides. Switches work at layer 2 in the Open System Interconnection (OSI) model and perform the function of separating collision domains. Q37. In the work area below, drag the OSI model layer on the left to its description on the right. The listed layers of the OSI model have the functions shown in the diagram above. Q38. What feature of TCP is illustrated below? Answer: D. Reliable data delivery ensures the integrity of a stream of data sent from one machine to the other through a fully functional data link. It guarantees that the data won’t be duplicated or lost. This is achieved through something called positive acknowledgment with retransmission—a technique that requires a receiving machine to communicate with the transmitting source by sending an acknowledgment message, based on the window size, back to the sender when it receives data. Q39. Which of the following is an example of a routed protocol? Answer: B. Protocols used to support data traffi are called routed protocols and some key examples of them include IP and IPv6. Q40. Which of the following is NOT a function carried out on the Application layer of the OSI model? Answer: B. Data translation and code formatting occur on the Presentation layer of the OSI model. Q41. Which of the following layers of the OSI model was later subdivided into two layers? Answer: C. The IEEE Ethernet Data Link layer has two sublayers, the Media Access Control (MAC) and the Logical Link Control (LLC). Q13. What feature of TCP is illustrated below? Answer: B. Windows are used to control the amount of outstanding, unacknowledged data segments. In the diagram, a windows size of three has been agreed upon by the stations. Q42. An example of a device that operates on the physical layer is a ____________. Answer: A. Hubs operate on the Physical Layer as they have no intelligence and send all traffi in all directions. Q43. Which of the following is NOT a benefit of using a reference model? Answer: C. While it is true that the OSI model’s primary purpose is to allow different vendors’ networks to interoperate, there is no requirement that any vendor follows the model. Q44. Which of the following statements is not true with regard to routers? Answer: A. Routers by default do NOT forward broadcasts. Q45. Switches break up _______________ domains and routers break up _____________ domains. Answer: C. Switches create separate collision domains within a single broadcast domain. Routers provide a separate broadcast domain for each interface. Q46. How many collision domains are present in the diagram below? Answer: B. The all-hub network at the bottom is one collision domain; the bridge network on top equals three collision domains. Add in the switch network of fie collision domains—one for each switch port—and you get a total of nine. Q47. Which of the following layers of the OSI model is not involved in defining how the applications within the end stations will communicate with each other as well as with users? Answer: A. The top three layers defie how the applications within the end stations will communicate with each other as well as with users. Q48. Which if the following is the ONLY device that operates at all layers of the OSI model? Answer: A. The following network devices operate at all seven layers of the OSI model: network management stations (NMSs), gateways (not default gateways), servers and network hosts.